The Churchill has always been an interesting vehicle for being as large and bulky as it was but carrying relatively light armament. The Soviets were not happy with it as it was a heavy tank to them armed like a light tank. But it served its purpose with Commonwealth forces and was primarily an infantry support vehicle. The Mark III version was the first large-scale production model and upgunned from the 2-pdr to a more useful 6-pdr. Years ago many of us who started out in small scale fell afoul of the Airfix Churchill Mk. VII kit, which had one of the most frustrating suspensions to assemble of any kit extant at the time. Coupled with its stiff vinyl tracks (which in their original silver production type also ate into the styrene plastic and ruined the model) it was nearly impossible to get a nice looking effort. A later effort from Hasegawa in 1/72 was much better but still left something to be desired. 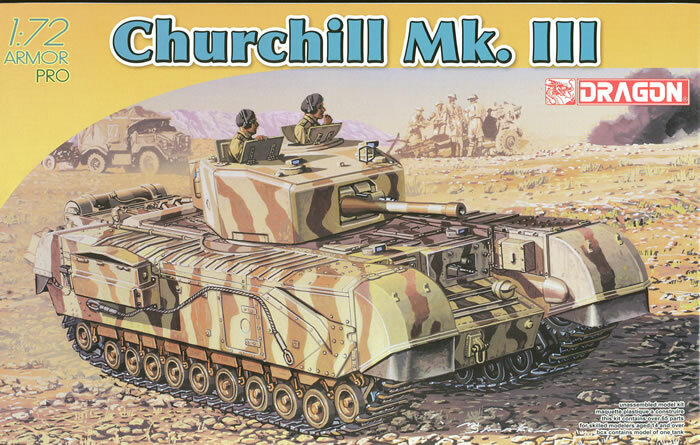 DML is now releasing a series of 1/72 scale Churchill kits and the first one to market is the Mark III. This is the welded turret 6-pdr variant and the kit comes with a few extra bits as well, such as the auxiliary fuel tank and four “flimsies” at the rear of the hull. Both turret hatches are of the optional position variety and the commander’s cupola may be rotated with a bit of work, but the other four hull hatches are molded in place. The kit is rather brilliantly designed with a slide molded hull pan that even includes see-through vents at the rear. The entire lower suspension runs on both sides consist of but two parts, but still capture the right look of the spring bogie assemblies and rimmed wheels. Separate drivers and idlers complete the suspension. The turret is an inverse of most kit turrets, with the base and sidewalls as one piece and the roof separate. An antenna base is provided (A9) but no antenna recommendations are included for it. No interior is provided other than both the hull and turret Besa machine guns being complete. This is one of the later DML DS Plastic track kits where DML indicates the proper length for the tracks is 205mm and advises stretching or cutting them to fit. I have had good luck with cementing the DS Plastic together so anyone should be able to get a good fit. Three finishing options are listed: 145th Regiment, Royal Armoured Corps, 21st Tank Brigade, Tunis 1943 (pink sand over brown-green); “Bill”, Canadian Army, Operation “Jubilee”, Dieppe, France 1942 (brown-green with red/white/red flashes and T number); and “Betty”, Canadian Army, Operation “Jubilee”, Dieppe, France 1942 (brown-green with red/white/red flashes and T number). A sheet of Cartograf decals is provided. However, while no expert on British and Canadian markings either the markings and finishing options seem wrong or the designations of the units seem wrong, and the Canadian equipment is not shown as per most photos of the operation with extended exhausts and other specific fittings. Overall, the model itself is a gem and should be popular with Commonwealth armour fans.